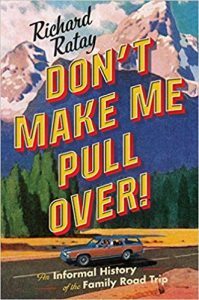 Part pop history & part whimsical memoir in the spirit of “National Lampoon’s Vacation”, Don’t Make Me Pullover! is a nostalgic look at the golden age of family road trips—before portable DVD players, iPods, and Google Maps. Between home & destination lay thousands of miles & dozens of annoyances, & with his family, Richard Ratay experienced all of them—from being crowded into the back seat with noogie-happy brothers to picking out a souvenir only to find that a better one might have been had at the next stop. The birth of America’s first interstate highways in the 1950s hit the gas pedal on the road trip phenomenon. In this road tourism-crazy era that stretched through the 1970s, National Parks attendance swelled & a whopping number of people visited Gettyburg ( 13 times the number of soldiers who fought in battle). Now, decades later Ratay reminds us, in hundreds of amusing ways, what once made the Great Family Road Trip so great, including 20-ft “land yachts”, oasislike Holiday Inn Holidomes, Smokey-spotting Fuzzbusters, 28 glorious flavors of Howard Johnson’s ice cream, & the thrill of finding a “good buddy” on the CB radio. Ratay shows how the family road trip came to be, how its evolution mirrored the country’s, & why those magical journeys that once brought families together-for better & worse- have largely disappeared.